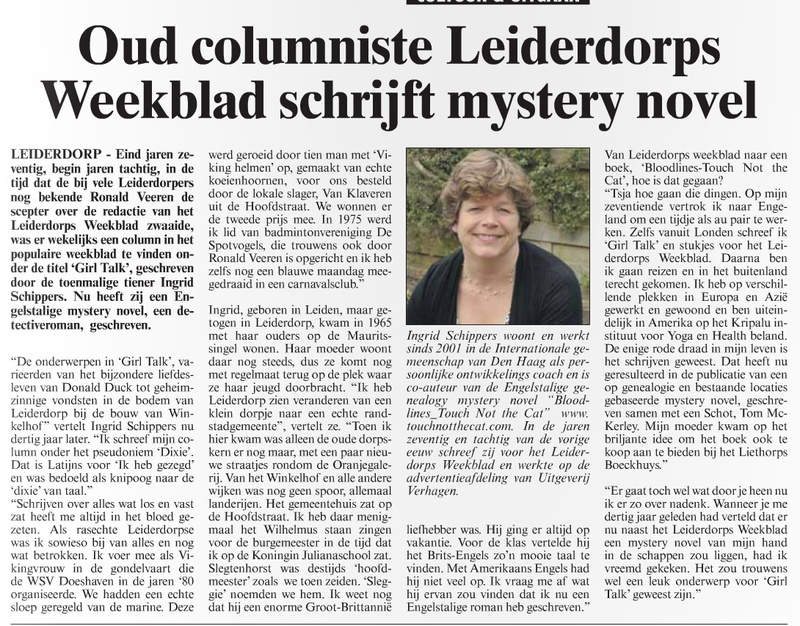 Ingrid appeared in an article in the weekly newspaper Leiderdorps Weekblad from Ingrid’s hometown in 1970-80, for which she used to write a column (amongst other articles) by the name of “Girl Talk”. Leiderdorp – By the end of the 19 seventies, beginning eighties; in the days Ronald Veeren – still known with many Leiderdorp oldtimers,- was chief editor of the Leiderdorp newspaper; a column could be found in the popular weekly, written by (then) teenager Ingrid Schippers under the name of Girl Talk. Now…she has written a mystery novel. “De subjects in Girl Talk, varied from ‘The Peculiar Love life of Donald Duck’ to ‘Suspicious Finds in Leiderdorp Soil during Building of Shopping mall De Winkelhof’”. Ingrid tells us 30 years later. “I wrote my column using the pseudonym Dixie; that’s Latin for ‘I have spoken’ and of course it refers to the ‘dixie’ of language. It has always been in my blood to write about anything that comes my way. 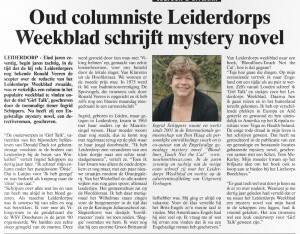 As a true Leiderdorp girl I was involved anyway in all sorts of local happenings. I was a Viking girl during a boat parade on the Does river, organized by the local yachting club, De Doeshaven. Someone from the navy had arranged an open rowboat for us, that seated 10 rowers dressed as Viking men with homemade helmets with cow horns stuck on them, donated by the local butcher van Klaveren in Mainstreet. We won second prize with it. In 1975 I became a member of the local badminton club ‘De spotvogels’, also goverened by Ronald Veeren by the way; and I even spend a blue moon with the local carnaval club. Ingrid, born in Leiden but raised in Leiderdorp, came to live on the Mauritssingel in 1965. Her mother still lives there to this day, so she still regularly comes back to the place where she spent her childhood. From Leiderdorps Weekly to Bloodlines-Touch Not the Cat; how did that go? “Yeah, how do things happen? I left Leiderdorp at 17 to work as an au pair in England. Even while living in London I wrote ‘Girl Talks” and articles for the Leiderdorps Weekly. After that I started traveling and ended up abroad. I’ve lived and worked in several places in Europe and Asia and finally ended up in the United States at the Kripalu Center for Yoga and Health. The only red thread in my life, has always been writing. This has now resulted in the publication of a genealogy novel based on true locations, written together with a Scotsman Tom McKerley. My mom had the luminous idea to also offer the book for sale at the Liethorps Bookhuys. I have to admit it stirs up old memories. When you would have told me 30 years ago that, next to the Leiderdorps Weekly, the bookshop would hold a mystery novel written by me; I would have looked at you strangely. But…it would have made a nice subject for Girl Talk. Ingrid Schippers lives and works in the international community of The Hague since 2001; is a personal development coach and co-author of Bloodlines-Touch Not the Cat (www.touchnotthecat.com) In the 19 seventies and eighties, she wrote for the Leiderdorps Weekly and worked with Verhagen Publishers.